Tea with the Dames is rather like a TV talk show without a host. Director Roger Michell has gathered together four old friends, who have worked with one and other on and off for six decades. They all have been created DBEs for their service to the acting profession. The eldest, at 88, is The Right Honorable the Lady Olivier, commonly known as Dame Joan Plowright. She has retired, but only because she has lost her sight. 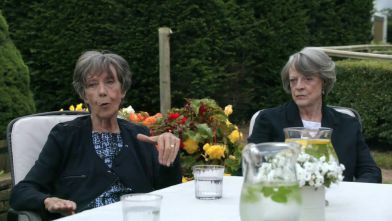 The other three, dames Eileen Atkins, Maggie Smith and Judi Dench are all 83 and still working. Their brief is simple: sit around a table and chat. The venue is The Cottage, the Oliviers' picturesque rural retreat. Carefully coiffed and costumed in shades of blue and white, the four ladies reminisce about their careers in theatre and on screen, about the pitfalls of acting with one's spouse and about working with the demanding Sir Laurence, which his widow cheerfully describes as having been “both a privilege and a nightmare”. Discreetly shot by Eben Bolter, this intimate film includes lots of fascinating archival material. It is particularly interesting to see footage of what the ladies agree is the most convincing performance they have ever seen on screen. Rounding off a succession of delicious anecdotes is sage advice to younger women, including “listen more”, “be less confrontational” and “practice mindfulness and yoga”. In this era of selfies and social media, it is interesting that these stars don't enjoy watching themselves on screen. Maggie Smith has yet to watch Downton Abbey. This charming tribute to four fabulous dames, closes with Dame Judi delivering Puck's epilogue from A Midsummer Night's Dream as the credits roll. The opening scenes depicting fog lifting over quiet countryside somewhere in Victoria are deceptively peaceful. The sight of what appear to be two fat ninjas on bicycles wobbling down the narrow bitumen road adds a mildly comic aspect. By the time they reach an apparently empty homestead, we have gleaned that the pair are brothers and this comfortable old house is where they grew up. But this is no nostalgic homecoming. Their nefarious purpose is murder most foul! Mastermind, older brother Jeff (Clayton Jacobson), has planned the deed in minute detail, heeding his intended victim's own motto, “failing to plan is planning to fail”. Nevertheless, the execution of the plan begins to go awry early on, gathers momentum and rapidly unravels. Younger brother Terry (Shane Jacobson) has reluctantly agreed to go along with Jeff's plan because he can't bear to think that their dying mother (Lynette Curran) would leave this house full of his happy childhood memories to Roger (Kim Gyngell), the man she married after their father's suicide.While Jeff clearly idolised their father, Terry had viewed him through less rosy lenses. The more the brothers reminisce, the clearer become the differences in not only their memories, but in their natures. As tension grows between them, various unexpected events throw Jeff's plan into utter chaos. Macabre though the plot is the screenplay by Jaime Browne and Chris Pahlow is deliciously, darkly funny. The Jacobson brothers have an utterly natural on-screen relationship. Kym Gyngell as Roger is so endearing that you totally understand why the boys' mother fell for him. Production designer Robert Perkins has filled the family home with solid old furniture, circa 1940 and lots of knick-knacks, truly a house full of memories. The score by Richard Pleasance discreetly complements Peter Falk's cinematography. Clayton Jacobson's direction is as deft as the comic touches he adds to his characterisation, such as wearing glasses over his balaclava. Although the characters in this particular story are Orthodox Jews in a small North London community, the basic issues of freedom of choice in matters of filial obligation, religion and sexuality are universal. Mid-shoot in her Manhattan studio, photographer Ronit Krushka (Rachel Weisz) receives news that her father, leader of a small Orthodox Jewish community, has died. Clearly, this has not happened. Ronit's return seems to embolden Esti, whose remarks at dinner have a rebellious tone. Soon, tongues are wagging and the past scandal is re-aired. Ronit's uncle, Moshe Hartog (Alan Corduner) harshly suspects her motives in returning to London. Yet, his wife Fruma (Bernice Stegers) treats her niece with empathy. Further complicating matters is the threat all this poses to Dovid's imminent accession to the leadership of the community. The friends' story makes an enthralling film that deals with so much more than the central love affair between Ronit and Esti. It is about truth, love, compassion, choice and acceptance. The screenplay for this provocative film was adapted by Director Sebastian Lelio and Rebecca Lenkiewicz from the novel by Naomi Alderman. Director of photography Danny Cohen, production designer Sarah Finlay and costume designer Odile Dicks-Mireaux make effective use of muted winter colours to convey the emotions of the characters. Matthew Herbert's score is similarly evocative. Writer-director Andy Fleming has drawn upon his personal experiences in the making of this film about a middle-aged gay couple, whose seemingly carefree existence is disrupted by the unexpected arrival of a 10-year-old boy in the middle of one of their lavish dinner parties. Erasmus (Steve Coogan) is the flamboyant star of a lifestyle cooking show. 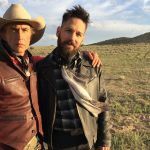 He and Paul (Paul Rudd) live in a luxurious lakeside hacienda outside of Santa Fe, but the boy's arrival provides the catalyst for underlying tensions in their relationship to surface. Young Bill (Jack Gore) is the son of Beau (Jake McDorman), whom Erasmus had fathered back in the '80s. With his mother dead and his father in gaol, Bill has no one else to care for him. Despite Paul's initial panic at the prospect of parenthood, it is he who initially assumes responsibility for Bill, enrolling him in school and providing him with some emotional security. Gradually, self-absorbed Erasmus also establishes a rapport with his grandson and finally grows up, himself. Although Ideal Home is essentially a comedy with heart, it is also an accessible depiction of relationships within any family unit. Fleming never allows his characters to become caricatures. They are layered and complex. Despite occasionally teetering on the brink of sentimentality, the screenplay is anchored by the underlying humanity of the characters and their circumstances. Scenes like the filming of Erasmus's show and the dinner party conversations might be outright funny, but the child welfare issues that the couple encounter are serious and addressed appropriately. Above all, Ideal Home makes quite astute comments on parenting and how important it is for a child to feel loved. 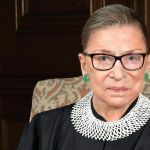 Directed by Julie Cohen and Betsy West, this documentary, traces the personal and professional life of inspirational US Supreme Court Justice Ruth Bader Ginsburg, the diminutive woman who, having been appointed to the Supreme Court on August 10, 1993, is its longest-serving member. RBG's core liberal sensibility has led to many landmark decisions on gender and racial equality ... basic common sense decisions. The film has been made with her full cooperation, so contains lots of archival material from her personal library. Joan and Joe Castleman (Glenn Close and Jonathan Pryce) appear to have an enviably harmonious marriage. When Joe is notified that he been awarded the Nobel Prize for literature, he is effusive in his praise of his partner, declaring that “Without her, I'm nothing”. 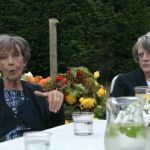 Although Joan's reticence to share the limelight at first seems merely to be modest, generous support of her husband, we gradually realise that, like their relationship, there is a much more complex reason. On the plane to Geneva, Joe rudely rebuffs Nathaniel Bone (Christian Slater), who intends to write Joe's biography, with or without Joe's permission. Bone's determination to reveal the truth subsequently provides the catalyst for Joan's long-sublimated resentment to surface. Although she sees through his unctuous charm, Joan nevertheless finds Bone's incisive appraisal of her situation empowering. A series of flashbacks reveal succinctly how misogynistic the literary world was in 1958, when young Joan (Annie Starke) declares to her professor, Joe Castleman (Harry Lloyd) that she aspires to be a novelist. Post-graduation, she sees firsthand how dismissive male publishers were of women authors. Yet, a writer has to be read. As we piece together what has happened, we understand that Joe's literary success has come at a price for the whole family, not just Joan. Joe might boast that his greatest achievement was getting her to marry him, but there is only so long that Joan can publicly play second fiddle to her philandering husband. Something has to give … and it does. Close gives an infinitely nuanced performance as Joan. She is magnificent! Director Bjorn Runge and his cast are well serviced by Jane Anderson's superb screenplay, based on the novel by Meg Wolitzer. Although The Wife does not officially open until August 2, hopefully there will be previews over the preceding weekends.